40 choice photos from volunteer photographers Teresa Konechne, Nils Palsson, Sari Steuber, and Carolyne Stayton are displayed below in four sections: "Opening, Closing, and Keynote Sessions," "Intensives and Workshops," "Fun Times in the Twin Cities," and "Open Space Technology and Bioregional Breakouts." Simply click on any of the images below to enlarge them and read the full caption. Marissa Mommaerts kicks-off the main conference with help from the youngest Transitioner at our National Gathering, her son Gabriel. Photo by Teresa Konechne. Participants close their eyes during a brief prayer led by Jul Bystrova during the conference's opening session. Photo by Teresa Konechne. Having fun amidst the chaos of a geographical mapping of all National Gathering participants. Photo by Teresa Konechne. Nils Palsson raises a fist in silhouette in front of a video recording of Rob Hopkins' keynote. Photo courtesy of Nils Palsson. A packed house to hear Post Carbon Institute Senior Fellow Richard Heinberg speak on Friday night. Photo by Teresa Konechne. Keynote speaker Richard Heinberg assures us there is no more important work than Transition. Photo by Teresa Konechne. Transition superstar Vicki Robin asks a question of keynote speaker Richard Heinberg during the Q&A portion of his presentation. Photo by Teresa Konechne. Standing Rock elder and water protector Phyllis Young awakens the Transition US National Gathering. Photo by Teresa Konechne. Two of the leading women of Standing Rock, Phyllis Young and Pearl Means, share the stage during Saturday night's keynote address. Photo by Teresa Konechne. Panorama shot of a bitter-sweet moment: the closing ceremony for the 2017 Transition US National Gathering. Photo by Nils Palsson. Jay Tompt with the Totnes REconomy Project leads a two-day intensive on "Skilling Up for Local Economic Resilience." Photo by Teresa Konechne. Economic relocalizers hard at work designing the future during a two-day intensive on "Skilling Up for Local Economic Resilience." Photo by Teresa Konechne. Paul Cienfuegos of Community Rights US leads a one-day intensive on "Community Rights: We the People Are More Powerful Than We Dare to Believe." Photo by Nils Palsson. 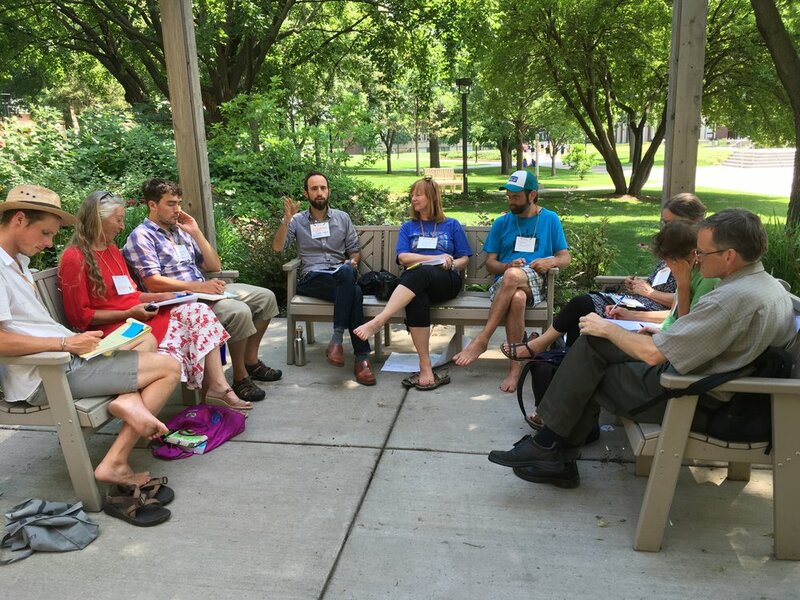 Adam Brock takes his class outside to enjoy the beautiful Minnesota summer during a one-day intensive on "Social Permaculture Strategies for Transition." Photo by Nils Palsson. Transition Trainer Tina Clark teaches "Taking Your Transition Initiative to the Next Level" during a one-day pre-conference intensive. Photo by Nils Palsson. Don Hall and company test out a variety of decision-making strategies during a two-day "Effective Collaboration Training" before the main conference. Photo by Nils Palsson. Some qualities of the Inner Transition posted on the wall during Rebecca Blanco's one-day "Deep Resilience" intensive. Photo by Nils Palsson. Four key questions guiding the "Deep Resilience" intensive led by eco-centered psychologist Rebecca Blanco. Photo by Nils Palsson. A few of the challenges Inner Transition practitioners face, pointed out by Rebecca Blanco during her popular "Deep Resilience" intensive. Photo by Nils Palsson. Keynote speaker and Standing Rock elder, Phyllis Young, speaks to the topic of "Decolonizing Transition" during a roundtable discussion on Sunday morning. Photo courtesy of Nils Palsson. Macalester College's own Christine Manning presents a workshop on "The Psychology of Sustainability" on Saturday morning during the main conference. Photo by Teresa Konechne. William Faith shares words of wisdom from Permaculture co-founder Bill Mollison during his "Permaculture Primer" workshop on Saturday afternoon. Photo by Nils Palsson. One of the greatest things about the National Gathering was that, every day, we got to savor the beauty of Macalester College's campus and the perfect late July weather. Photo by Nils Palsson. Often the most productive times during a conference are the informal breaks, when we are able to connect with each other on a fully personal level. Photo by Teresa Konechne. Little sparks of goodness, like this impromtu free store, were flying everywhere during the National Gathering. Photo by Teresa Konechne. Somebody wisely realized that everybody needs a break sometime from the hard work of changing the world, and brought mandalas for everyone to color! Photo by Nils Palsson. 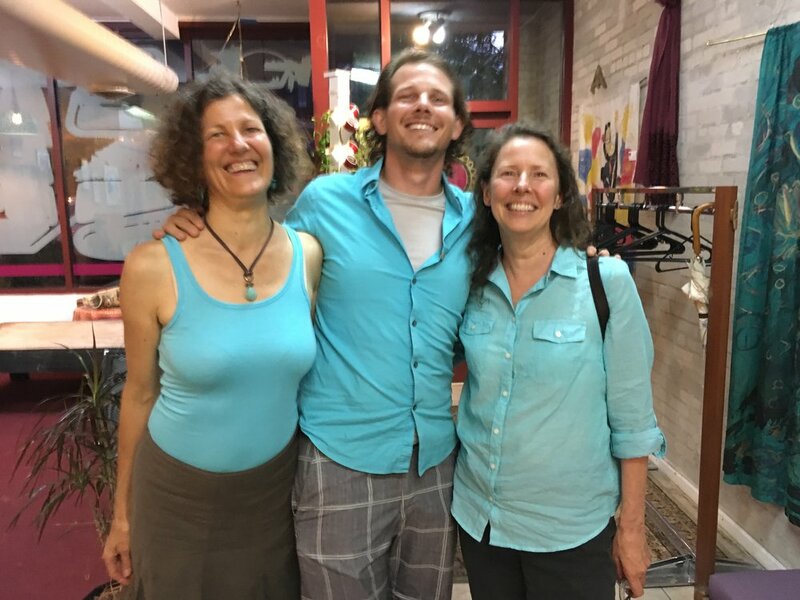 Tina Clarke, Nils Palsson, and Kristina Zill are beaming with satisfaction after an amazing dinner at Minneapolis' Gandhi Mahal. Photo courtesy of Nils Palsson. Late-night "Transition pints" at local bars kept the lively conversations going, sometimes into the early hours of the morning. Photo by Nils Palsson. 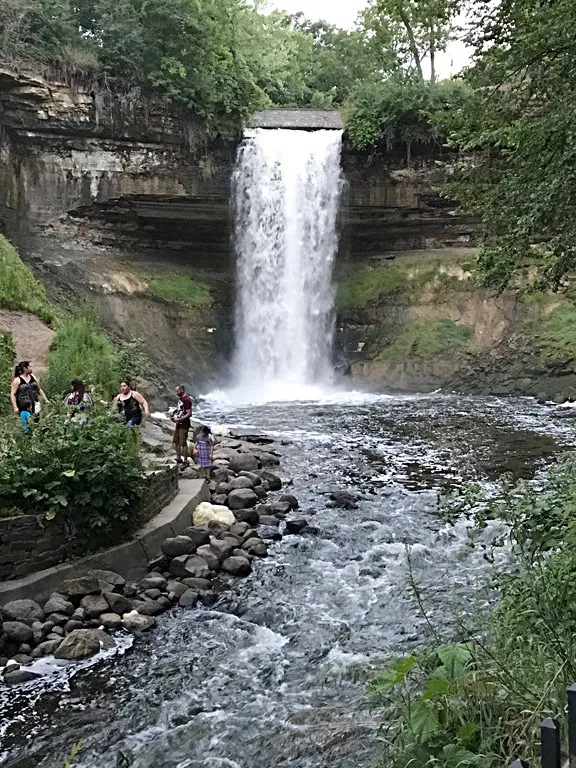 On the last night of the Transition US National Gathering, many participants took a field trip to Minnesota's breathtaking Minnehaha Falls. Photo by Sari Steuber. Phil Metzler of Transition Goshen (Indiana) readies himself to host an Open Space discussion on the topic of Collaborative Fundraising. Photo by Teresa Konechne. Sylvia Holmes, Paula Holden, and Raines Cohen propose Open Space sessions on the League of Cities, addressing activists' needs, and eco-villages, respectively. Photo by Teresa Konechne. After teaching an intensive and a workshop about Community Rights, Paul Cienfuegos seizes one last opportunity to talk about the cause that's most dear to his heart. Photo by Teresa Konechne. Rebecca Blanco of Tampa, Florida and Jul Bystrova of Sebastopol, California team up to host an Open Space discussion on Inner Transition. Photo by Teresa Konechne. Nina Smolyar, Theo Talcott, Kristina Zill, Ruah Swennerfelt, and others explore the territory of Open Space together. Photo by Carolyne Stayton. A large crowd has flocked to the Open Space discussion on Inner Transition, giving birth to a national Inner Resilience Network. Photo by Carolyne Stayton. Sari Steuber, Sherman Eagles, Dawn Wesley, Kathy Juedeman, and others bring together three interrelated topics about education at their Open Space table. Photo by Teresa Konechne. 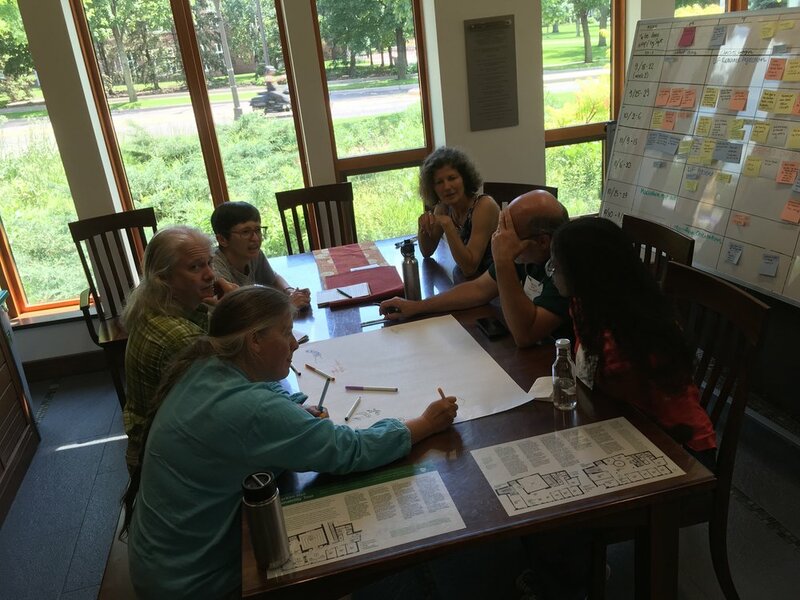 West Coast Transitioners represent and brainstorm ideas during their Sunday morning bioregional breakout. Photo by Teresa Konechne. It's no great surprise that the biggest bioregional breakout group, by far, were those Transitioners from in and around the Twin Cities. Photo by Teresa Konechne. Small but mighty, Cathy Day and Leila Salim held down their bioregional breakout on behalf of Transition in the Southwest United States. Photo by Teresa Konechne.